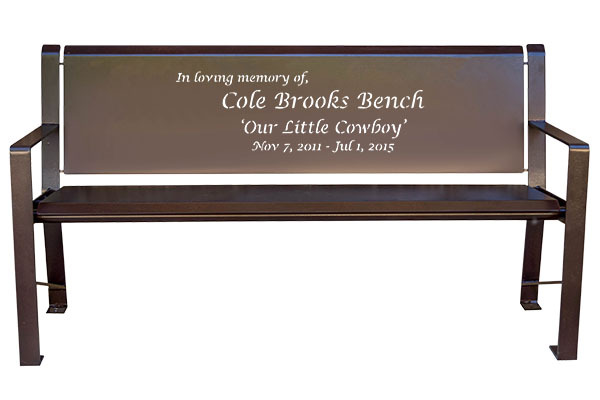 Looking for a custom memorial bench? The Metropolitan Memorial Bench is our most unique bench style. Its modern design is a perfect addition to commercial and private properties. 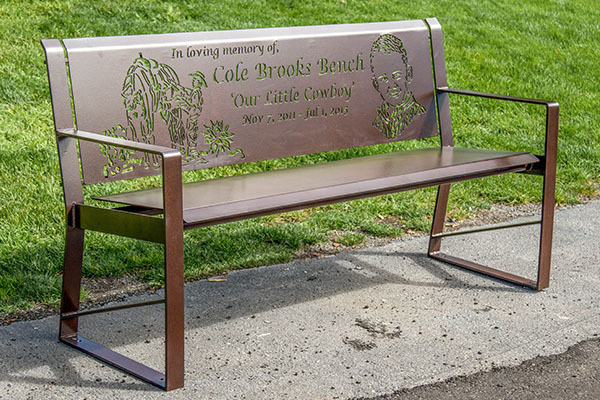 Each bench is available with personalized inscriptions and images across the bench back. 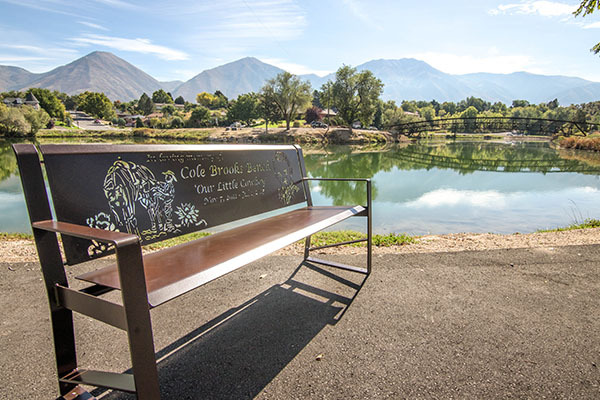 Get started on a Metropolitan Memorial Bench by calling (801) 414-1724. 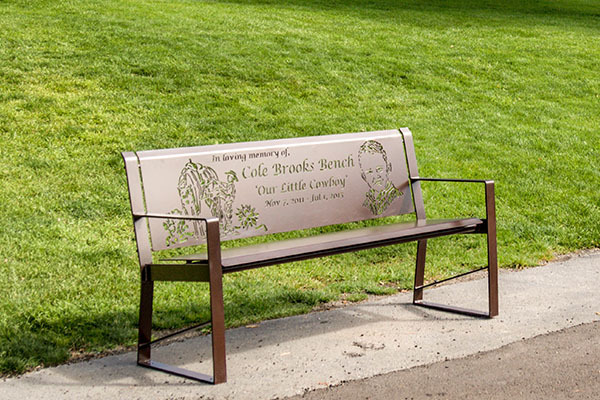 Metropolitan Memorial Benches are available in three bench sizes: 4′, 6′, and 8′. We also make Child Size Benches. Each bench is crafted with durable steel and fully closed welds. Powder coat is applied to prevent weathering and rust. Powder coat protects against sun fade, chips, scratches, rain, and more. Choose from our color options here. 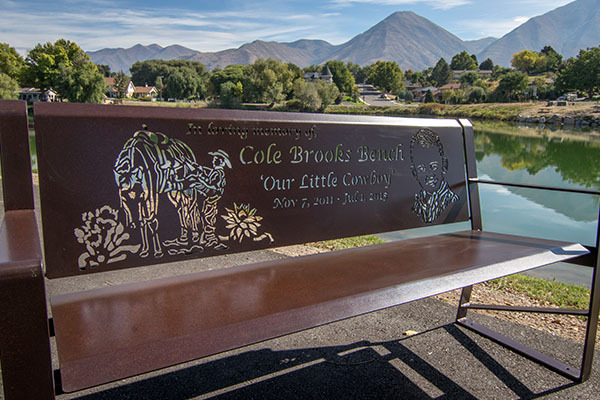 Inscriptions, poems, images, and portraits can be laser cut directly into the back of the metal Metropolitan Bench. 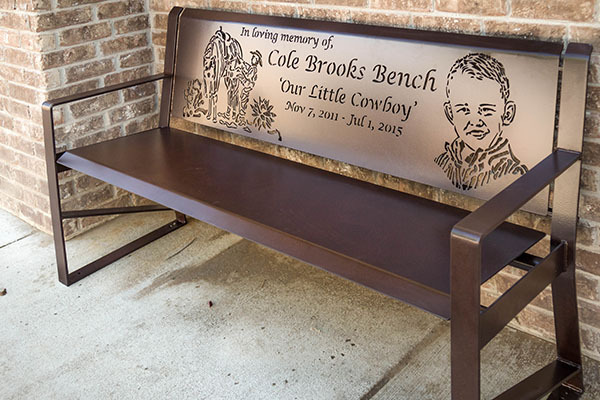 Portraits are a beautiful way to personalize the bench even further. Our designer is capable of taking photographs (even old, low-quality ones) and adding them into the bench design. Once we have an initial mockup, it will be emailed to you for final approval. We will not start on the actual bench until you have fully approved the memorial bench design. 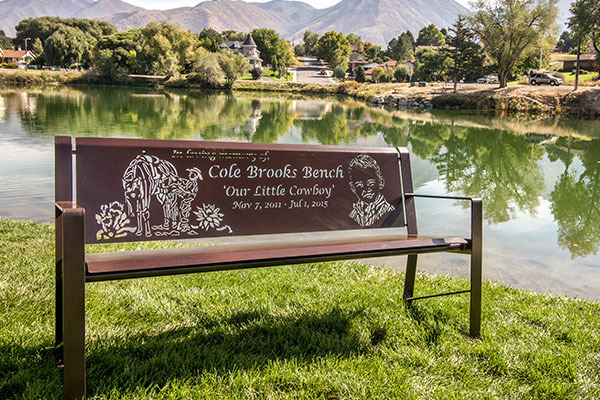 Why Powder Coat The Memorial Bench? Powder coat is the number one way to ensure that the bench will be long-lasting. The powder is baked into the metal. This results in a tough finish that is twice as thick as most paint. This impermeable layer will protect the metal against rain, hail, snow, and harsh sun rays. For added personalization, the powder coat is available in a large assortment of colors. These include classic white, vibrant reds, and modern bronzes. You can view our colors here or call (801) 414-1724 for more details.